So you’ve just bought your new snowboard, have your bindings and you’re about to set them up – but you’ve just realized you aren’t sure how to tell nose from tail on a snowboard! So you’re not sure where to set up your front binding. If you have a true twin deck then it’s no problem and it doesn’t matter which way you set it up. But for anything but a true twin it’s important that you set your board up so that it’s riding in the correct direction. For example if your board has a setback stance and you set it up the wrong way then you’ll end with a stance that has you closer to the nose than the tail – and that’s just going to be awkward! But there less obvious reasons why your board won’t perform properly if you set it up backwards. Things like the side-cut, the camber profile and the length and width of the nose and the tail can all make riding your board backwards less than ideal. So How Do I Tell? There are a few simple ways to tell so that you know which way is nose (aka tip) and which way is tail. If your snowboard has a setback stance then use this one. Measure from one end of the snowboard to the first set of binding holes (those closest to the end). Measure from the other end of the snowboard to the first set of binding holes at that end. Whichever distance is the greater distance will be the nose end. Check the graphics. If there are any graphics or words that have a certain way up and they run width-ways across the board then if you stand the board with its tail on the ground and nose at the top then the writing/graphic will be the right way up. See image below. If test #1 or #2 still don’t help – maybe because the writing run from tail to nose or nose to tail (rather than across the board width-ways ) or the graphics are symmetrical or don’t have a particular way up – then try this one. Go to an online store that sells the board or to the manufacturer’s website. Usually the board will be shown vertically (like the shots above). The nose is at the top and the tail at the bottom. If the graphics are completely symmetrical and there are no words then you won’t be able to tell from this but otherwise you should be able to work it out by doing this. 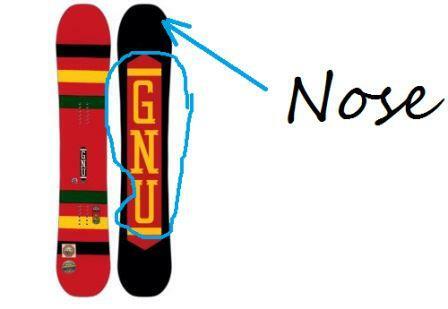 Hopefully one of those methods will help you to determine where the nose of your snowboard is and where the tail is. If you’re still having trouble determining this then leave a message in the comments section below and I will try to help you figure it out. Or if you have any other ways that you know of for determining the nose and tail let us know in the comments below. Color side or black side ? It’s hard to say, as the LTR is just a rental board usually, not a production model, so it’s hard to find specs for it. And there are several different colorways over the years. But I think I found an image of the model that you mean. And I think, at a guess, it’s the end with the white Burton symbol – so the black end. But since the LTR, from what I can tell, is a true twin, centered board, it doesn’t actually matter which end you set up for because the board is, as far as I know, completely symmetrical.